Note: All links to other web pages will open in a new window to prevent you losing your place on this page. Remember to close those pages once you have read them! Objective: To provide instructors teaching a fiber optic course guidance on how to structure the course and teach it using the FOA Online Reference Guide To Fiber Optics, providing hints to make the course easier to teach and provide students with a comprehensive preparation for the FOA CFOT certification exam. 1. Using the FOA Curriculum or incorporating the appropriate materials in your presentation slides and handouts. 2. Assigning reading in the textbook and the chapter questions for homework and studying the NECA/FOA 301 Installation standard. 3. Assigning the material included in the The FOA Online Reference Guide to Fiber Optics and taking the quizzes (Test Your Comprehension) on each page and studying the FOA Installation Tech Bulletin (downloadable from FOA Tech Topics). 4. Using the self-study programs on Fiber U in a blended learning course where students have a mix of online and classroom instruction in preparation for hands-on labs. Either way, your students should be prepared for the CFOT exam. This is a study guide for the CFOT exam based on #3 or 4 - using the FOA Online Reference Guide to Fiber Optics, FOA YouTube videos or Fiber U self-study programs. 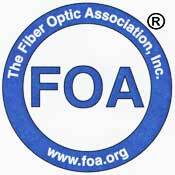 The NECA/FOA-301 Fiber Optic Installation Standard. You may request a free copy in PDF format to provide to your students. Fiber U: http://fiberu.org/ for online self study courses, including a CFOT online study course for use in blended learning. FOA YouTube channel, Lectures on fiber optics and hands-on videos. How do you use this material in teaching a course? Just like you would use our textbook. Like many instructors, we prefer not teaching directly from the textbook, but instead using slide presentations that elaborate on the material and include more visual learning aids. We refer the students to the textbook for outside readings and require answering chapter questions on the materials. The FOA expects you to cover the relevant material for the CFOT or other certification as appropriate in your classes. We origianlly developed the CFOT certification Exams from references from our earlier textbook, the The Fiber Optic Technicians Manual, 3rd Edition which has been replaced by our new textbook The FOA Reference Guide to Fiber Optics textbook and - this is important - have included the same references for the CFOT exam in The FOA Online Reference Guide To Fiber Optics. Thus, if you assign students to read relevant sections of The FOA Online Reference Guide To Fiber Optics and take the section quizzes, they will be able to easily pass the CFOT exam. Another way of using this material is to create Online Lesson Plans. As part of the processes of developing this material, we have created an online lesson plan around this material and the FOA curriculum (PPT, instructor and student guides, etc.) and it has been used to teach a course. More on this below. Students always like videos, either in class or as homework. The FOA has uploaded over 60 videos to YouTube that include over 25 lectures on fiber optics, 10 lectures on premises cabling and over 30 videos on various hands-on activities. Check the latest list on the FOA YouTube channel, thefoainc, for all the topics available. If you can stream video into class, use a PC and projector to show them. If you do not have broadband Internet in the classroom, contact the FOA and we can provide you with a DVD of the videos to play on your PC. This online reference guide to fiber optics was created as an alternative to the FOA textbook for training designers and installers of fiber optic networks, although a printed version is available for those needing a printed textbook. An online reference is less expensive than a textbook, easier to keep up to date and, for those who have grown up using the web for searching out most information, a preferable source of knowledge. The organization of the site follows the typical training programs given by most instructors. It starts with a section on the basics of fiber optic technology ( Fiber Optics, The Basics), which includes topics covering the jargon and the technology of fiber optics, how fiber is used in networks, components, installation and testing, to give the reader a complete, concise section to learn about the technology. This section is a concise summary of the material that is covered in the CFOT exam. The site is then divided into additional sections that cover all the relevant topics in much greater detail and includes “Virtual Hands-On” tutorials on common processes used in fiber optics. Below is a description of what material is covered, how it is organized and how it can be used in conjuction with a FOA CFOT course. Studying the topics under Fiber Optics, The Basics, reading supplemental materials relevant to your course and correctly answering the section quizzes will prepare students for the CFOT exam. Below you will find a summary of the material in each section and suggestions for supplemental reading. At the end of each website section, there is an online quiz, called “Test Your Comprehension,” which asks questions about what’s important in each section. These quizzes will automatically grade your responses and provide the rationale for the correct answer. These questions should be used to identify areas that need more study before taking the CFOT exam. Besides links to the pages in the FOA Online Reference Guide to Fiber Optics, we include references to the appropriate chapters in the new printed textbook the FOA Reference Guide To Fiber Optics (FRG). The materials included in the website are similar to the material in The Fiber Optic Technicians Manual (FOTM) the previous FOA reference for the CFOT which many of you may have already. For those who also have the textbook and are also using the online reference guide, the correlations between online reference topics in “ Fiber Optics, The Basics” and the book chapters are included. What's Covered In The Topics Included in Fiber Optics, The Basics ? This is an introduction to fiber optics, including some history, and an overview of where it is used. A short section discusses the differences between fiber and copper and what has become the basis for fiber’s dominance of the communications industry. Finally, to emphasize their importance, safety and the need for cleanliness are discussed. The first thing one needs to understand in order to be able to comprehend a new technology is the “language” unique to that technology. This section gives concise, often illustrated, definitions of the terms used in fiber optics. It is a most important section, as a basic understanding of the terms used will make the rest of the material much easier to comprehend. In this section, network applications for telecom, CATV and various local area networks (LANs) are described. Fiber's role in each of the networks is covered in detail, in relation to the copper wiring still used in many of them. It is important to understand how each of these types of networks use fiber and how they differ. This section covers the heart of fiber optic technology, the fiber itself. Here you learn how fiber works, the different types of fiber and important fiber specifications. Like the Jargon section, this section provides important background information for many of the other sections. This chapter is an overview of the purpose of cables (basically protecting fibers in the outside world) and how they are used. It covers the different types of cables and their applications. Choosing cable types appropriate for the application is very important for designers of networks, as it affects network cost and reliability, but requires knowing the different types available and their properties that determine the correct choice. Be sure to note the sections near the end on indoor cable flammability ratings and color codes. This is an overview of termination and splicing types and techniques. The student should physically examine samples of the most popular connectors (ST, SC, LC) if possible but the page includes photos of most types. You should understand which connectors are used where, the various methods of termination and ferrule end polishes, as they are important issues in choosing and using connectors. The discussion of splicing covers technical details of fusion and mechanical splicing, with emphasis that most SM outside plant splicing is fusion, while mechanical splices are used more for restoration and MM splicing. Supplemental reading: Fiber Optic Components, Termination and Splicing. View VHO: at least one of the adhesive/polish connector tutorials, the PPS termination, SM termination and at least one of the splicing tutorials. This section covers only an overview of fiber optic network design; essentially enough for the reader to understand the process behind network design. Since the FOA has a certification on Fiber Optic Network Design, there is a large amount of reference material on this reference site that is appropriate for advanced study. The topic of fiber optic cable plant installation is a very diverse subject, since fiber is used in so many different types of installations in so many different environments. This section provides an overview of the installation processes for many applications, with an emphasis on safety. This section contains a lot of material. The types of test equipment are important to understand, as are the relevant specifications and applications for the instruments. Three types of testing are included: continuity testing, insertion loss tested by a light source and power meter and OTDR testing according to industry standard test procedures. This section includes the basics of testing but supplemental tutorials cover actual processes. An overview of the standards process and standards for fiber optic components and testing. Most standards are written for manufacturers who interpret them for their customers, but a basic understanding of the goals of standards is important for everyone involved in fiber optic technology. This section is provided for reference purposes and as an elaboration to the Jargon section. While the section Fiber Optics, The Basics covers the primary information covered in the classroom of most fiber optic courses, we have provided much additional material that provides greater details on many relevant subjects. Here is a summary of the topics covered. This section is a “work in process” where we will be updating and adding additional information regularly. Some topics are included without links while work continues on those topics. FOA YouTube Videos - over 100 videos including lectures on fiber optics and hands-on installation videos. While the major emphasis of The FOA is communications applications of fiber optics, we have an interest in other applications like sensors, lighting and inspection. This section includes articles on all these various applications. This section includes additional technical topics of general interest and references to fiber optic standards. This is one of the most important topics for study and this section not only elaborates on component types and specifications, but includes many slide-show tutorials and what we call “Virtual Hands-On” tutorials covering fiber optic processes like cable preparation, temination and splicing, in step-by-step format. These “Virtual Hands-On” tutorials have been created from studies of the process that analyzes them in detail, breaks them into individual steps and explains those steps including background information and options. These “Virtual Hands-On” tutorials are generally considered better than videos as they are easier to understand and each step can be studied as long as desired. Links to videos are also included for those who prefer online video. Since the FOA has a certification on Fiber Optic Network Design, there is a large amount of reference material here and on the FOA Tech Topics site that is appropriate for advanced study. Those interested in the topic or the FOA CFOS/D certification should study this section carefully. This is one of the most important topics for fiber optic technicians involved in field installation. It covers topics that primarily elaborate on the Basic coverage of installation and explain exactly how some common elements of installation like attaching pulling eyes or “figure-8-ing” cable are done. The proof of the quality of any fiber optic installation or manufacturing process is the test results. In this section, we have provided much more information than is commonly available on fiber optic testing, covering the instruments, the tests broken down into specifics for various components or subsystems, and several explanations of technical issues often glossed over that can greatly affect measurement validity. While our primary focus has been on installation, understanding how to use the systems, from managing design and installation thorugh maintenance and rstoration, is a major issue for owners of the systems and their contractors. Most classes follow a fixed curriculum or lesson plan. We have created a lesson plan that provides an overview of each lesson, references from the FOA Reference Guide to Fiber Optics textbook, the older Fiber Optic Technicians Manual textbook, The FOA Online Reference Guide to Fiber Optics website and the PowerPoint Slides from the FOA Curriculum Kits. This 10-part lesson plan is available for your use: Here is our Lesson Plan. Consider it a work in process as we plan to expand it as we create more material. If you have created your own web pages, you can create your own lesson plans using links to The FOA Online Reference Guide to Fiber Optics . Studying the sections under Fiber Optics, The Basics, reading supplemental materials relevant to your interests and work and correctly answering the section quizzes will prepare you for the CFOT exam. Use the FOA Online Reference Guide as a refresher course at any time or access it from the field when you need a quick reference on a process or procedure or just to help educate others (such as contractors discussing procedures or standards with their customers.) If you have a web-enabled device like a cell phone, most of the site has been designed to be viewable from one those devices.